Finally, an elegant way to move multiple guitar stands! Eliminate the tangle of legs, yokes, and parts. This stand folds into its own case hardshell case for storage and transport and there are no knobs, rubber feet, etc to lose. 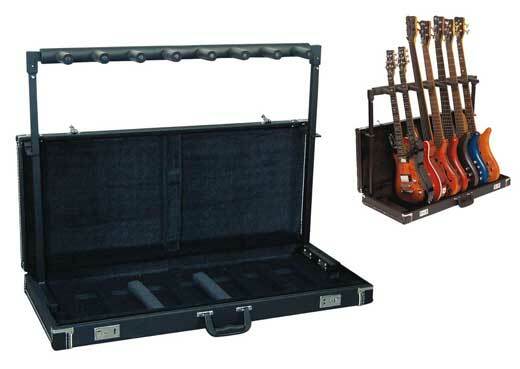 Comfortably holds any combination of up to 5 electric and acoustic guitars and basses. Features rugged black tolex wood case black velvet interior sturdy plastic handle pin lock system for a quick and easy stand setup adjustable inside dividers that are fastened with Velcro. 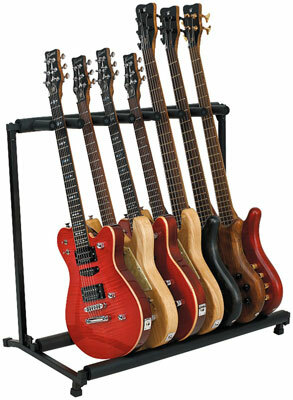 RockStand Folding Multiple Guitar Stand; Organize your Jam Space or Take it on the Road. 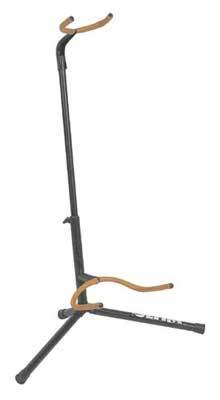 You can leave all those tripods at home and just bring one of these stable, folding stands to the gig! They're foam-padded so they'll never scratch your instrument and they hold acoustic or electric guitars & basses. This is one of the coolest designs we've seen in years! Compact for easy storage in your closet our tour van. Rock Stand Guitar Stand Features Strong Foam Padding to safely rest your guitars for years to come Easy to setup Package contains all screws and required tools Assembly instructions included. Whether you own an Electric Guitar, an Acoustic Guitar, or a Bass Guitar, the Ultra 2445BK Guitar Stand will fit your needs! It features rubber tubing on the neck and bucket to protect your instrument, and the legs and neck support fold for compact storage. Another great feature is its free-swinging bucket that allows it to hold guitars with unconventional body styles - like V's and Explorers.